I don't have much power equipment in my workshop. 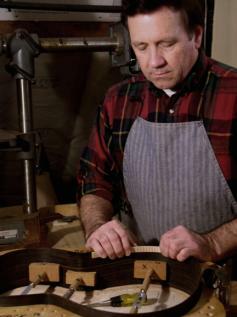 I prefer to primarily use hand tools, as they lend more satisfaction when working with the wood and are more in keeping with the Old World masters. I usually have several guitars under construction in my temperature and humidty controlled shop. 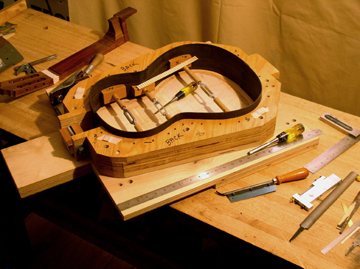 I have found it is very important to the life and tone of the guitar to maintain the proper construction and storage environment ( the humidity at which it was built). My woods are also stored at a constant temperature and humidity. Preparing to add the lining.